UUFSD sits on four acres of beautiful tall trees and flowering shrubs. If you are interested in renting our unique facility for your special occasion, please visit our Rentals & Weddings page. The outdoor Amphitheater is a beautiful outdoor site nestled in the hills, surrounded by nature. Approximately 200 guests can sit comfortably under shade umbrellas. Weather permitting, we use this unique setting for our services. During inclement weather we meet in Founders’ Hall, which seats 175 people comfortably. The Hall was designed by Architect Rob Wellington Quigley and built by Wardell Builders. The contractor generously included volunteers on construction clean-up, brick laying, painting, and more, so over 100 members of the Fellowship had a part in constructing the Hall. After the service, join us for coffee and snacks in the heart of our campus in what we call the core area. Visit the activity tables to learn what we have to offer. Peruse the book tables. Chat with members. We often have luncheons to raise funds for the Fellowship and other causes. We welcome visitors as our guests to these events. Palmer Library, in addition to the basic library function, is home to many of our social groups and committee meetings. 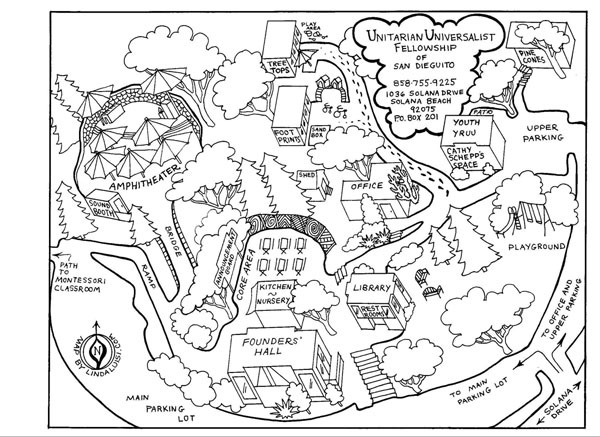 Click here to download a full-sized copy of the UUFSD site map.